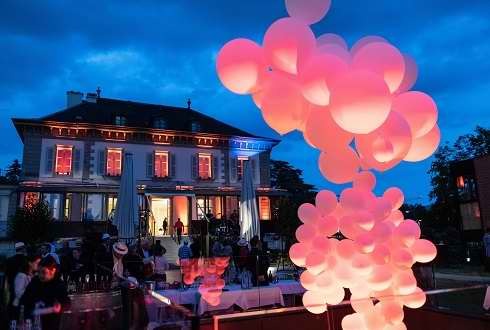 300 guests flock to the portal of the Ecole Hôtelière de Genève to attend its now traditional Garden Party “Chapeau l’EHG”. Guests are encouraged to come “wearing” their best headgear and a contest rewards the best hat! Once you have crossed the long red carpet and greeted Alain and Suzanne Brunier, respectively Director General and Director of the EHG courses, you will discover the school’s magnificent new gardens. Sophie de Quay & the WaveGuards provide the musical performance. 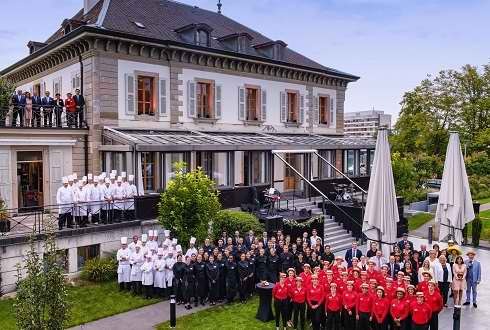 The buffets serve the specialities of the EHG’s 3 catering units: restaurant Vieux-Bois, restaurant L’Auberge and EHG Traiteur Geneva. The students of the last semester are in charge of the reception, while their classmates of the previous semesters are busy in the kitchen and on duty. “This garden party is a very good opportunity for our young people to experience a great event on the field by being involved. They are all the more motivated, even proud, that the EHG serves as a beautiful setting for this elegant event,” says Alain Brunier, General Manager of the EHG. Players try their luck at the Ferris wheel, roulette or blackjack and are rewarded with very nice prizes offered by the EHG partners. A mini concert by Sophie de Quay and the WaveGuards punctuates the mid evening. It should be noted that Sophie de Quay is a graduate of the EHG. During her concert, she welcomed the young artist Tanya Chraïbi, herself a recent graduate of the EHG. Among the guests were many hoteliers, restaurateurs and EHG partners, as well as representatives of local authorities and the media. Through their professionalism, their involvement and their most beautiful smiles, the EHG students proudly carried their motto “Excellence in the service of a Profession”. A Direct News report is a great success with Internet users: already 14,000 views!